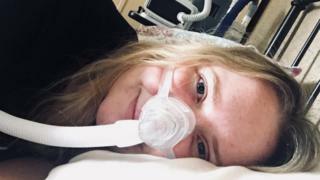 There are now 354 people waiting for a new lung in the UK, compared to 242 in 2012-13 - Laura Beattie from Greater Manchester is one of them. "I've known for more than 20 years that I would need a transplant one day but I was still terrified to be told I was going on the list because it made it real," said Laura. "But I know it's the right thing to do. I get breathless even turning over in bed or getting dressed." She said: "I could be waiting a short time or a long time, I don't know. I just try and get on with my life. "I really hope more people support and really consider donation because a transplant is my only option now and donation can save so many lives." In contrast, there are currently 6,013 people on the overall waiting list for an organ - a 17% decline over the same period, from 7,335. "Many of those lives could have been saved or transformed had more families said yes to donation," he said. "Sadly, many donation opportunities are lost every year because families don't know if their loved one wanted to be a donor or not. We urgently need people to tell their families they want to donate."